Before the residents of Mapuru were able to access any educational services for their children, they first had to construct a school building and find a resident who was willing to teach without pay. This is a story about broken promises and a determined and strong community. A history of Mapuru's struggle to become a recognised school. If you are a black parent don't expect your kids will get the same access to schooling as white kids, it just doesn't work that way in the Northern Territory. Before the residents of Mapuru [an Aboriginal homeland in north-east Arnhem Land, 600km east from Darwin] were able to access any educational services for their children, they first had to construct a school building. They had to find a Mapuru resident who was willing to teach without pay for six months. This was, and still is called the 'trial' period before becoming an acknowledged Homeland Learning Centre. In 1982 Mapuru parents saved their money and built the school house. For six months they operated a school program without pay and minimal assistance. In 1984 Jackie [Nguluwidi] began working as the Assistant Teacher at the centre. While Jackie has no formal teacher training he, like all Mapuru parents, is extremely committed to all the children in his community. In 1998 Jackie's uncles Johnny [Galngdhuna] and Kevin [Gätji] asked the Department of Education for a permanent English speaking teacher to be resident at Mapuru. This, and other requests were ignored for the next five years. Their words fell on deaf ears. Early in 2003 Kevin sent a letter to the [Northern Territory] Minister for Education [Syd Stirling]. There was no reply to this letter for several months, but after follow-up letters and several telephone calls the Minister visited Mapuru in late 2003 and promised, at a meeting with residents, that qualified teachers would soon be living permanently and teaching there; nothing happened. In 2006 Kevin visited the Minister in Darwin who reaffirmed his intention to honour the previous commitment. Again the community was disappointed with the lack of response. Mid 2007 the community told their story to ABC's Stateline. During the program Jackie said "...I am just worrying, they (the children) are starving for English, they are starving for maths." On the same program Yingiya, Jackie's father said, "...We want to be equal in education. We want to be equal in life. Just give us a chance, give us a go." That is, Mapuru only wants what every other child in Australia has, a school with qualified teachers. 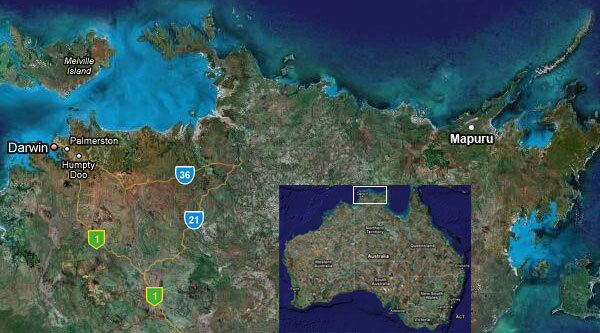 Mapuru is located about 500km east of Darwin. The ABC's Stateline program reported that the Education Minister at the time Paul Henderson "...doesn't think these children are getting a raw deal. He says the students at Homeland Learning Centres achieve close to the same results as children at schools", implying they don't need full-time teachers. Paul seemed to miss the point, that if home-lands were given fulltime teachers they would do better than their hub school counterparts. The Minister promised to investigate, and sent a delegation. The residents were told by this delegation investigating their circumstances that they would not be given a full-time teacher. With no alternative and being a Christian community they approached the Northern Territory Christian Schools Association (NTCSA), who expressed interest in their plight. In early 2008 the NTCSA met with the Mapuru community and agreed to work with them to fulfil their dreams. In May community members met with Minister Marion Scrymgour asking her to support their goal to become an Independent Christian School. A detailed application was prepared and sent to the Northern Territory Department of Education in July 2008. Mapuru expected that their application would receive approval within a month or two and they would be ready to start the 2009 school year with at least two resident qualified teachers. After months of delay Mapuru residents suspected that their application had been rejected, and would not be approved. Before we go any further we need to mention a few facts about Mapuru. There are [about 150 adults and] over 40 school age children living at Mapuru, and more of preschool age. Every day every child present at Mapuru goes to school. In 2002 Jackie's mother provided funds to establish a food co-op (small shop) in the school so children could learn about real money, using English and ICT [Information Communication Technology] for ordering and bookkeeping. Three years later this food co-op was awarded the National Heart Foundation award for a Small Community Initiative. This year Jackie won a NT government Research and Innovation Award for his skills in using e-technology and teaching Mapuru's children and adults to run the food co-op, and eco-tourism business, to use internet technology to order and pay for goods, internet bank and use eftpos technology. The women of Mapuru have been successfully managing and operating the ecotourism business Arnhemweavers for 6 years, because they are desperate for their children to have a future living on their ancestral lands (see: www.arnhemweavers.com.au). There has never been alcohol at Mapuru, and the women say there is no domestic violence and no child abuse. Despite the difficulties, residents are determined to live at Mapuru where they know their children will have a happy, safe and productive future, away from the dysfunction of the nearby large townships. They are determined to keep their children away from the youth suicide, teenage pregnancy, lack of parental control, substance abuse, lethargy and the band wagon of negative impacts of Western culture. They need to become an independent school because they want the right to select teachers who are sympathetic to their aspirations. They want to ensure the co-op and weaving business is incorporated into a holistic curriculum, and they want greater say managing the school. Mapuru is a cohesive and strong community, with focused aspirations that could become a model of education and enterprise excellence in remote Australia. In fact Mapuru has been actively seeking partnerships as outlined in Julia Gillard's Family-School Partnerships Framework with education for the past 10 years. All they need is for the government to join the partnership and enable them to have a school like other Australian children, respecting their decision for an Independent Christian School. As Julia states, "Families have a major influence on their children's achievement in school and through life and the evidence shows that when schools, parents and communities work in partnership, children tend to do better in school, stay in school longer and enjoy school more." Dr Chris Sarra echoes these important sentiments saying "If we're going to talk about partnerships, we have to talk about both sides of the partnership, not just one." Meanwhile there are over 20 schools in the Northern Territory with less students than Mapuru, each of these schools together with over 60 cattle stations and other sites are kept up to date with the latest satellite technology and access to quality distance education with government funding. To add further insult to injustice, in 2007 Mapuru was denied access to distance education for its older students by the NT Department of Education. Recently things have changed. Education representatives met twice with Mapuru residents. At the second meeting the community's decision was made clear. They wanted to become an Independent school, not remain a Homeland learning centre and not become a small government school managed by the nearby hub school Principal. They wanted to be able to choose people who don't just want to be teachers, but who want to be members of their community and further community aspirations and enterprises within the curriculum. Not possible with the government system. A month later a delegation again met with some residents offering them status as a small government school. The residents felt disrespected and insulted that the previous consultations and decision had been ignored. Mapuru residents say, "they are giving us sugar stories, they are not listening to us." If you are concerned and want to support Mapuru, please send Letters to the Editor's of the major newspapers, and also write to Marion Scrymgour, NT Minister for Education and NT's Chief Minister, Paul Henderson, expressing your outrage at the government's disrespect and inaction towards Mapuru residents. Request the approval of Mapuru's application to become an Independent Christian School. 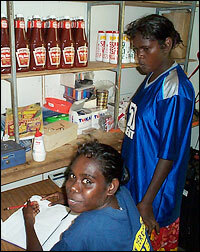 Linda and John were both teachers at the school on Galiwin'ku, Elcho Island. They have friendship that goes back over 30 years with the Jackie Roslyn and their families. Linda is currently employed with NT DET as a literacy adviser, and John lectures at Yolŋu Studies at Charles Darwin University. Both Linda and John are keen to see all Australians treated respectfully and fairly. Johnny and his younger brother Kevin, now both deceased, were the senior custodians for the country around Mapuru. They are Jackie's and Roslyn's uncles. Can remote Aboriginal schools compete? Can an Aboriginal school break the vicious circle?